I haven't read anything by this author in years, but I always used to love her books. I'll have to give this series a try. I'm really enjoying this series! The history and ghost angles are pretty great! I loved the setting for this book and enjoyed the mysteries. I didn't love the book but did enjoy it. I did enjoy it though I often feel like I just want a little but more from her books but they're usually such fun I forgive her! 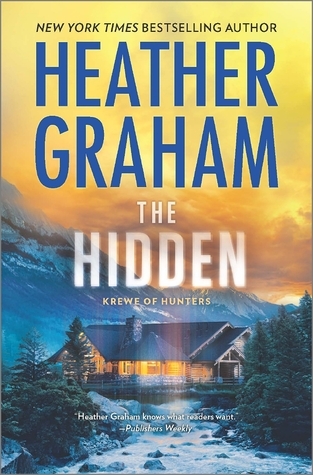 I've been curious about Heather Graham's books for years and years, but never got around to reading any of hers. Also, ghosts! I love ghost stories. I definitely need to check this out. Glad you enjoyed this. Read her!! I think you'd like the ghosts and the plots. There are some flaws but they're fun so I know I'll enjoy them. I love Graham and I am slowly making my way though this series as I wanted to start at the beginning, now I am curious about The Hexed since it's your favorite...lol. I am only on #3...sigh so far to go...lol. Even though I've read the newest ones I haven't read the early ones. I own them of course so I'll get there! YAY, I am glad you enjoyed this one too Katherine. I really did! It was nice since I hadn't loved the last 2. Gah. I keep saying I need to read more Graham, but never get around to it. It's been a long time since I've read anything by her. She has an insane number of books and I'm so behind! I could do nothing but read her books for a month and still not been done! I think you would like her because there is so much going on other than just a straight forward mystery. There romance and history and ghosts. I'll be interested to see what you think of her if you do get it or one of her other books. Not gone on the paranormal aspect as I've never read a mystery/paranormal theme before. The pacing sounds great though and if it weren't for the paranormal element, I'd totally add this one! I'm not sure if you'd enjoy this one. The paranormal is definitely a big one and it doesn't feel like the books you usually enjoy. You need to read her! I think you'd enjoy her books and you can definitely jump in where ever you want! Great review, Katherine! I really enjoyed this one, too, in spite of some of the flaws you mentioned. As you say, they're just plain fun! I have this one to read and am looking forward to it. I like the idea of the couple in this one being already established as all the ones I've read so far are new to each other. It'll be a nice change.